The key thing to remember when it comes to social selling, is that very few people actually use social media to buy! So, if you constantly push sales messages to them, you push your prospective customers away rather than pulling them towards you. In order to ‘sell’ through social media, we instead need to find a way of building a community who want to hear from us and who are then open to our sales messages when we release them. 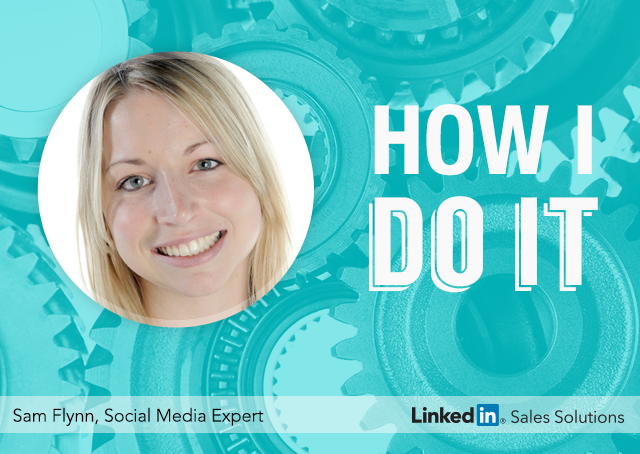 I sell through social media by being the expert! So, how do I do this, and how can you be the expert on platforms like LinkedIn, Twitter and Facebook? Don’t hold back your best knowledge. This is what will really help to raise you as the expert. Share tips and advice that will add value to your customers’ day. This gives you far more opportunity to add value, and it drives traffic to your website if you host it on your site! Aim to blog at least once a week. And don’t just post about the blog once. Mention it several times until the next blog post is live. That way you are maximizing the number of visitors to that blog. Just change the wording for each update that links to the blog. For example, you could use the title, ask a question about the blog, mention something within the blog, cite a comment from the blog, etc. Be the knowledge hub for your customers by linking to articles that are relevant to them and give them value. As you share content related to your industry, this also opens your customers’ eyes to what it is you do. No one wants to do business with a corporate machine! We all want to be talking to someone at the end of a tweet! So, use what I like to call your BRANDONALITY. This is the personality of your brand. Whether your brand is fun, dry humoured, crazy, to the point, opinionated, colourful or outrageous, then be that on social media! Posting about more than just your business and what it is up to will help to build conversation and trust. After all, this is ‘social’ media. Social media offers a great opportunity to capture leads in to your business, typically in the form of email addresses. Offer something for free, which gives enough value to the potential customer that they are happy to part with their email address for it. This could be a free report or whitepaper, an ebook, a webinar invitation or a money off coupon. You should then have an email marketing system in place to follow up with these leads. Autoresponders are great for continuing to market to your leads. Aim to send more value emails than sales ones! Asking questions encourages your audience to engage with you and build conversation. This will then help to build trust and will lead to more sales. It will also help to build your online audience. Having done all of this, occasionally posting sales messages is the right thing to do. You’ll have done all the hard work above to build the relationship, that you should then work to convert to a sale. The easiest way to encourage the sale is to release deadlined offers. People will take action if they only have access to the offer for a specific time period. So, remember, the key with social selling is not to ‘sell’ but to pull people towards us, build trust and be ourselves. The sales will roll in as a result! Be the expert on social media to pull people towards you and build their trust that you know what you are talking about! When you do sell online, make sure it’s in the form of a deadlined offer, to encourage your customers to take action NOW!